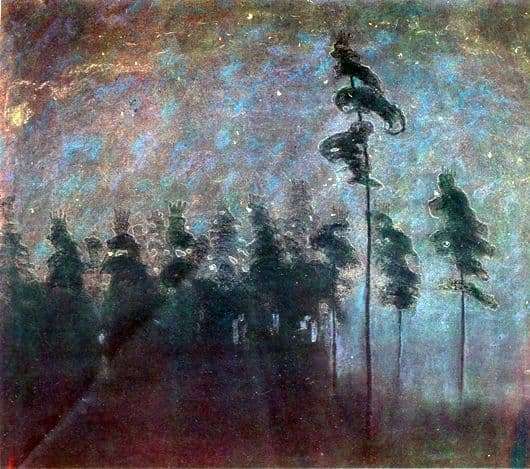 Mikalojus Konstantinas Čiurlionis is an artist who sang the beauty of Lithuanian nature, but not in the usual sense. Many critics see in his paintings something cosmic, the struggle of heaven with the earth. He puts art to a new level, presenting evolution not as a natural process, but as the influence of higher powers. The influence of the cosmos is felt in his paintings, possessing a special attraction for the gaze of the audience. The painting “Forest” is an excellent proof of this. He is looking for harmony: a dark forest and a silvery haze enveloping the trees, as if trying to become one. The sky is decorated with bright and colorful elements and makes a person understand that without him nothing would have happened. It also suggests that the artist is more inclined to the heavenly manifestations. In fact, lights are dancing in the sky, like at the north pole, creating an uneven glow all over the surface. Many peoples who saw this phenomenon of nature, attributed to the powerful spirits. For one tribe it was a refuge of ancestors, for others – a glow from swords, for example, like a Viking. The artist seeks to show that our thinking forest hinders our spiritual development, represented by a colorful sky that develops the frontier of consciousness. Trees are suppressed by their black oppression of reality. The forest is depicted as a kind of amazing form magic, and above it the sky is luminous and mysterious “stars”, transparent and elusive luminaries of the incomprehensible cosmos. In the picture, all objects are subject to a single holistic process of the cycle of otherness. In his picture one feels a certain detachment from the world of people. During his lifetime, many critics and art lovers considered the artist strange. Often Čiurlionis was not understood at all. His philosophy was too thin, and in order to perceive this amazing work, it was necessary to have the same fine outlook or at least understand it. The artist painted his paintings with not so high technique as a deep soul. You can see the blurring of forms that succinctly fall on the general perception of the plot. They allow you to poetically view the picture from different angles.